The shore is the memorial ground for many children under the age of five who died that day. Each name written on a board at the beginning of a row of saplings that have been planted recently. Women in the area water the plants every morning and evening with dedication -- as if they know these memorial trees will grow up to protect them if the sea were to rage again. On the morning of Republic Day, a short distance from where the destroyed boats are piled -- many still have the Indian flag fluttering from the sails -- the Panchayat Union Primary School is preparing for its first celebration after the tsunami took the lives of its 59 pupils. Some kids have turned up early to help the schoolmaster. The flag post was painted and paper flags put up yesterday. One kid quickly brooms the ground, an alpana is neatly drawn in front of the flag post, the teachers arrive in their uniform of crisp green saris and the kids scurry back home to wear their uniforms. "A few days back there was a rumour of another tsunami, so many parents came to school and the children ran up to the terrace," says Headmaster Balu, "They are getting back to normal, but get scared with such talks of another tsunami." 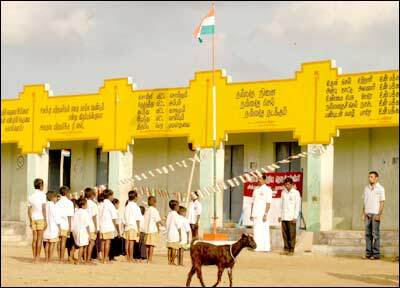 The children  around 25 odd - arrived neatly dressed just as the village head, the chief guest, reached the school. But it was S Pradeep, a smart Class V student, who conducted the solemn ceremony. He led the school into observing his country's 56th Republic Day with dignity and confidence which would make any Indian proud. He marched to the flag post handsomely. Invited the chief guest to hoist the flag and commanded the boys and girls to salute the Tricolour, followed by a song for the national flag. Then the students took an oath reposing their faith in the nation  "Always to stand by truth, justice and your society. To serve your village and to make sure the nation is never divided." This was followed by the National Anthem, led by the teachers. Addressing the students, the headmaster said: "We should consider this another birth as we have been spared and make a greater effort to become a success in our lives." At the end of the ceremony, the kids received chocolate éclairs and a packet of biscuits each. One of the guests at the function was a British lady who had arrived in Nagapattinam on December 31 and had been spending time at the school. She heard of the tragedy in France and just rushed to India. She stood observing the ceremony and on speaking about the children was moved to tears. "These are wonderful kids, they are lovely. We would like them all to get a good education," she said requesting us not to reveal her name. The lady with a band of local volunteers has been painting the classrooms with pictures that children will find cheerful when they return. "We hope that the students who are coming to school will encourage their friends to return too." At India's Ground Zero  where another body was recovered on Tuesday taking the tsunami toll to 6064  Republic Day was observed with solemn respect. Yes, it was short of the customary pageantry but not of its glory.